They collected Fernando Alonso also, who'd performed a prodigy to get up to a net second. A victim of his own skills. 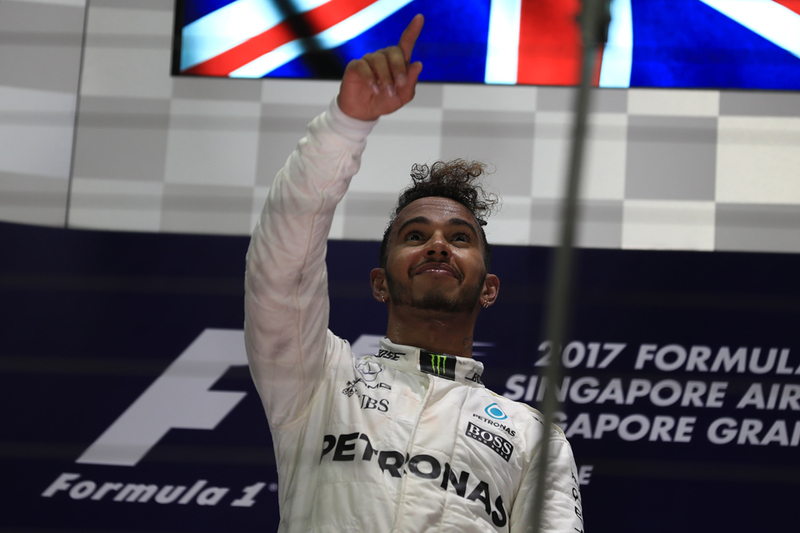 He said later that "the podium was guaranteed or maybe we would be even fighting for victory." His engineer Pete Bonnington quickly spelled it out. It's now about bringing it home. Lewis said he knew. "Not ideal is it?," said Seb later, appropriately. What 'fault' there was, was Seb's. Though equally it all seemed rather a racing incident. Seb's 'move to cover' is, sadly, standard for the poleman these days (Lewis did something like it at Monza). But perhaps given the conditions and title considerations he could have been more circumspect. Verstappen thought so. "Mainly Sebastian," he said when asked to apportion blame. "He started squeezing me, maybe he didn't see Kimi on the left. "That's not an excuse - if you're fighting for the world championship, you shouldn't take those risks to squeeze someone that much. "What does he expect? It was not very clever. I don't think it was a racing incident." 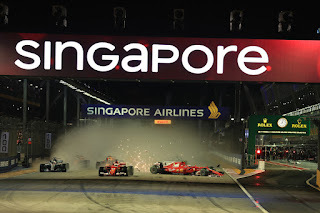 "I don't know, I didn't see that much," Vettel said. "That's how this business is, and we'll move on. It doesn't change much." 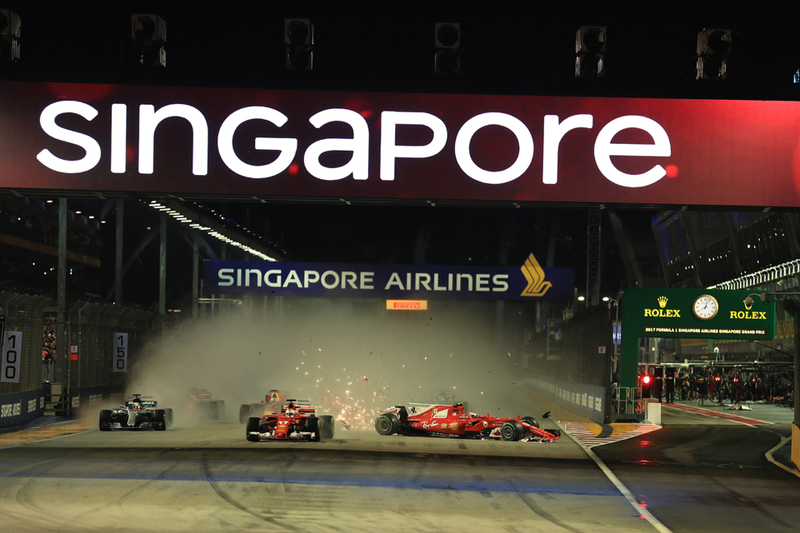 "I don't think I could have done anything to change the end result apart from doing a bad start and not being there," Kimi added. Lewis did more than bring the thing home however. 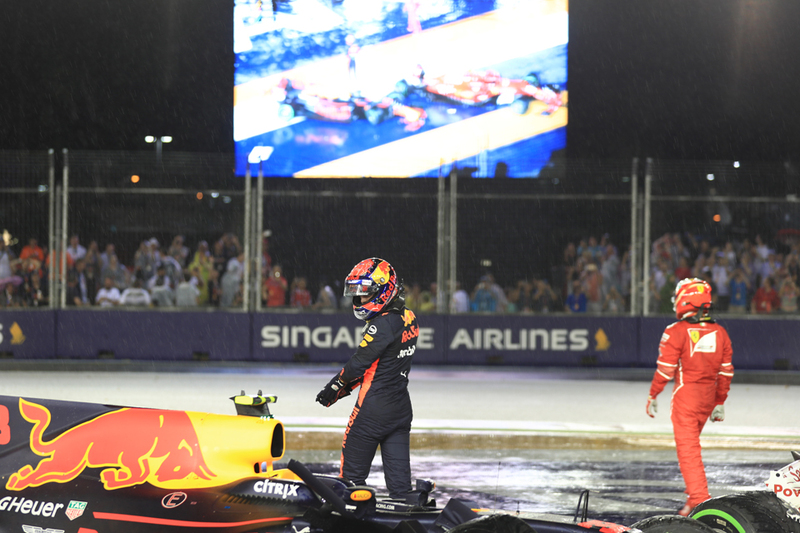 He showed all his flair in these most challenging of sceanrios and quickly scampered away from Daniel Ricciardo - no wet weather slouch he. 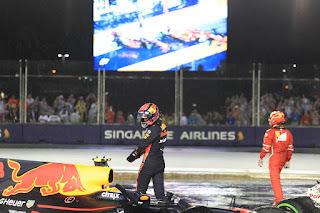 This included after a mid-race safety car (brought about by Daniil Kvyat binning it) wherein the Australian had smartly changed to fresh intermediates. Despite 11 laps more age in his rubber Lewis stretched 4.5 seconds clear after 10 laps of subsequent green flag running. On older tyres and not in the quickest car this weekend. It seemed mainly about Lewis. Underlining as much, the other Mercedes of Valtteri Bottas was nowhere near - 20 seconds off him after 12 laps of green. But come half (nominal) distance it was good for slicks - all took them on and that was that. 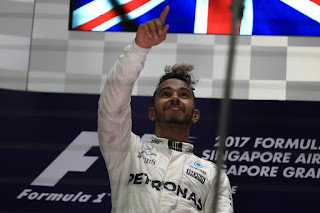 Lewis, possibly not believing his fortune today, was about the last to change, but still emerged with an 11 second advantage. 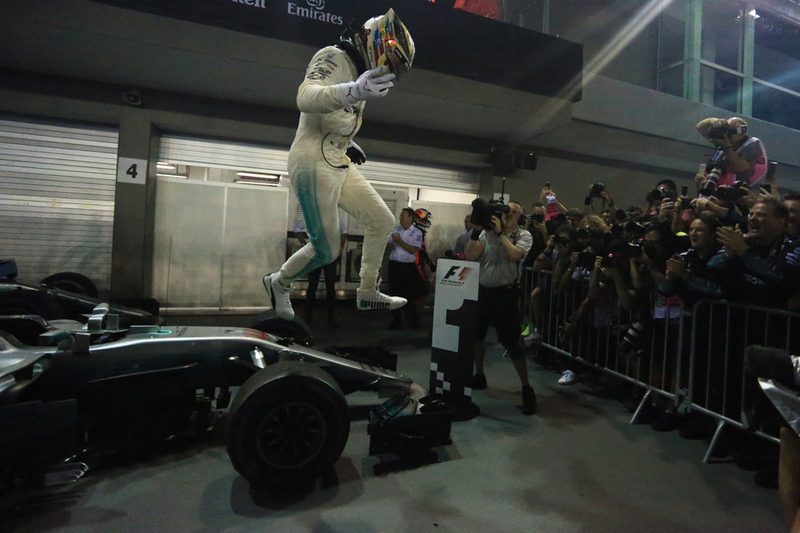 "Obviously I was very fortunate with the Ferraris at the beginning" said an elated Lewis, "couldn't be happier. "I capitalised on the incident, who would have known that would happen?" But he insisted it wasn't all about the early smash. "I needed it to rain and as soon as it rained I knew where I was going to finish," he added. "I knew I had the pace when it rains, unfortunately we just didn't have the car in the dry." Someone worked out that's eight wet F1 race wins on the trot for him. "Motor racing!," exclaimed his boss Toto Wolff increduously. "This morning we were waking up with a bad feeling talking about damage limitation, and here we are 24 hours later with a massive step forward in the championship." 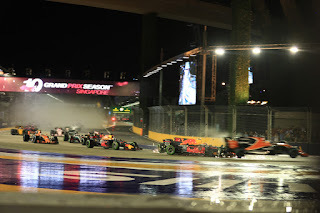 His Renault team mate Jolyon Palmer - despite a difficult weekend off the track - put in a spirited run and with some overdue fortune finished sixth. He even threw in an opportunistic pass of Bottas. The other McLaren of Stoffel Vandoorne also stayed out of trouble to get seventh. In both cases it was their best ever F1 finish as well. Lance Stroll, Romain Grosjean and Esteban Ocon completed the scorers. 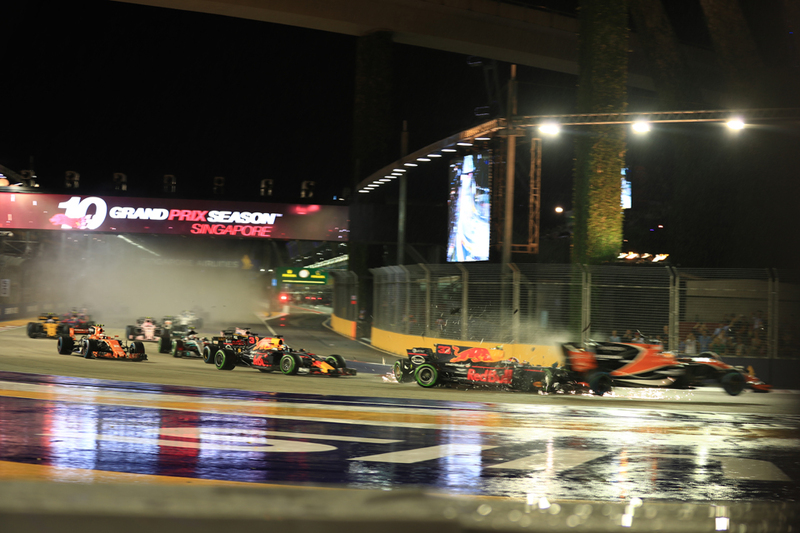 Only 12 made it home and one of those - Pascal Wehrlein - was two laps down. But if much of this race's drama was extracted after the first few seconds, it still feels pivotal. Lewis's title lead now is 28, Mercedes's weakest track is done and after months of to and fro suddenly it's hard to see anyone else taking this year's title. Short of something like today happening in reverse. Though given what we said at the outset, we shouldn't rule that one out.